For her second birthday Luke and I gave Maddy a sweet little green tricycle. It had a bucket in the back to carry all her favorite stuffed friends around with her or to fill with the treasures she found along our walks around the neighborhood. 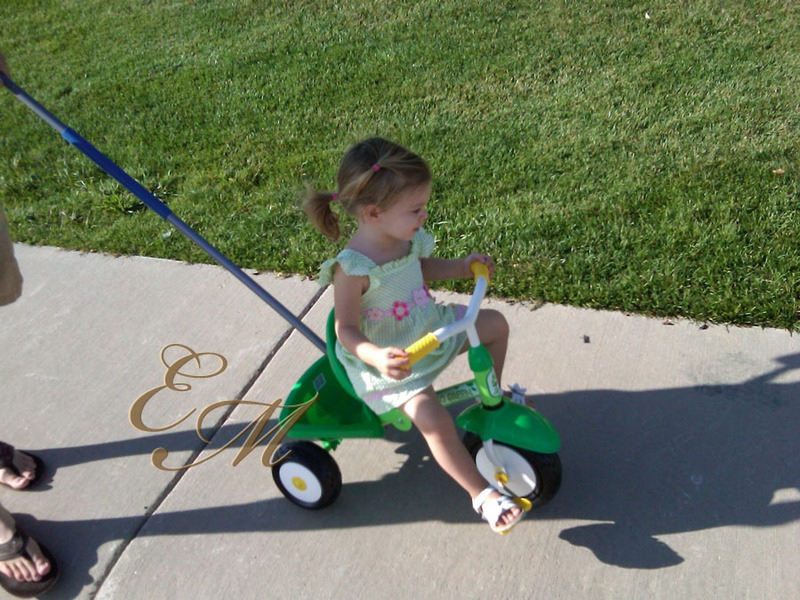 Oh, look how cute she is on that little trike. Her hair was so much shorter. Her little legs were so much shorter. I’ll never understand how much she can change in just a year and a half. Lately, as in for the last handful of months, Maddy’s cute little green tricycle has been looking smaller and smaller under my growing girl. Her knees hit the handle bars and her body ends up hunched over trying to steer. I’ve watched riding around our cul-de-sac with her friends, the twin 5-year-olds from a few doors down, and knew it was time to upgrade. 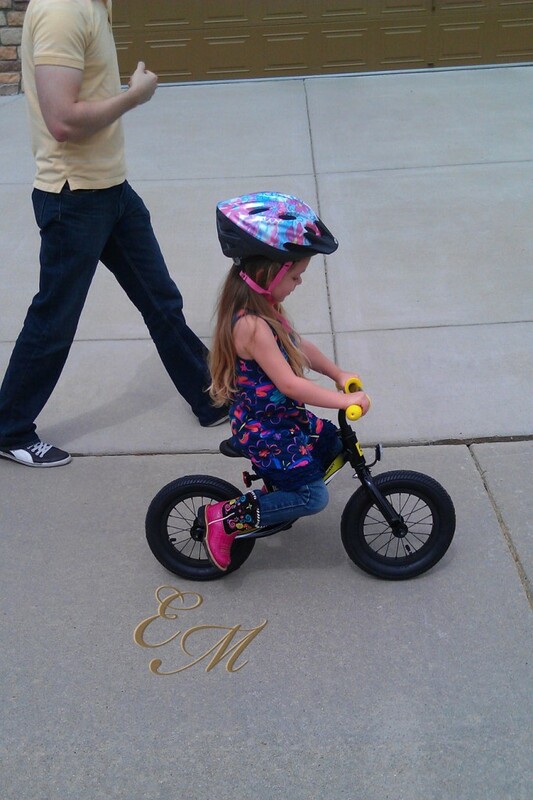 Poor Maddy was just too big for her tricycle and needed something that could go a little faster. Enable her to keep up with her fast 5-year-old buddies. And, most importantly let her feel just a little more wind in her hair as she cruised around the sidewalks of our neighborhood. I had my eye on a balance bike for her. Luke wasn’t so sure. After a few months of hints, and a Sunday morning of watching kids on balance bikes he was convinced enough to visit a bike shop in our town to see a balance bike in action. After about a half hour in the store watching Maddy’s confidence on a balance bike increase with every minute Luke was sold. And so was that speedy black balance bike Maddy had fallen in love with. It’s thrilling to watch her confidence and balance grow to quickly. In her first long ride she went from shuffling her feet along and rolling down the sidewalk to taking a few big powerful steps and then listing her feet from the ground and gliding along the sidewalk for a few feet. Before long she’ll be flying down our way-too-steep-driveway and zipping through our neighborhood. Maybe I’ll actually get to start running more frequently, just so I can keep up with her. Before we know it she’ll be ready for a huge bike with peddles and then I have no idea how we will ever keep up with her again. Although, I’m not sure how I even keep up with her without wheels. 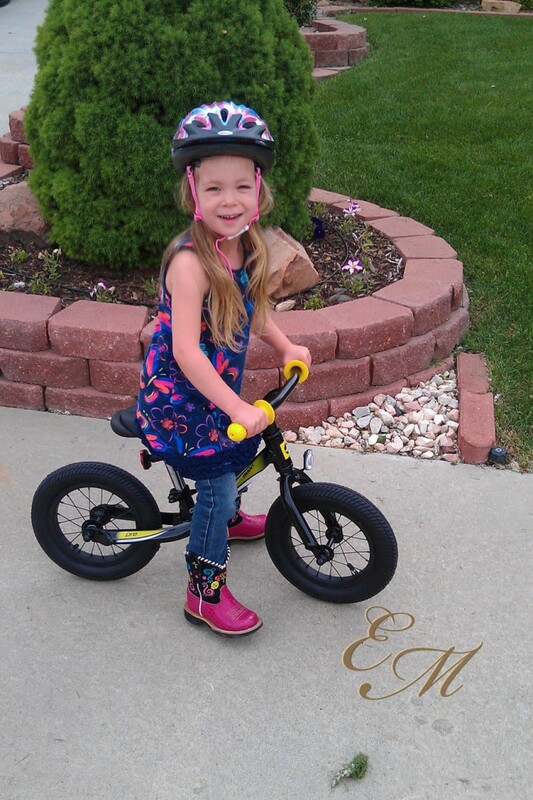 So have your kids used a balance bike or training wheels? She looks completely adorable in those pictures! I have never heard of a balance bike. So no pedals, just push powered and go? My kids all did training wheels for a year or two but they all could ride two wheelers without training wheels by 5 or so. My kids have all had the same bikes for 4 years or so, now that we’re moving they’re all getting new bikes once we’re moved. They are very excited! Maybe Maddy can bring her bike over to our new house and ride around with them (since we don’t have a bike rack and their big bikes don’t fit in my trunk). We are looking at bike’s for our 5 year old. He’s super tall so I think we’re just going to go with one with training wheels. Although…he’s fallen in love with a cool bike that you sit in a seat. He rides it all over Dicks every time we visit. She has grown a ton!! Gee, riding a bike is such a metaphor for how she will grow up and you won’t be able to run fast enough to catch up to her – just hope you taught her to ride well *sob* Leaving that aside, we are a bike riding family – all except my youngest who hates riding (more like he hates falling off, so threw a tantrum every time and we just got tired of it). Living in Boulder, there’s really no excuse with all our bike paths, not to ride all summer. (Kind of speaking to myself here.) It’s a great thing to do with the whole family, and getting them started early is the best thing ever! What a big girl! I love that confident smile she sports. Love the pink cowboy boots. With those I bet you can ride anything.